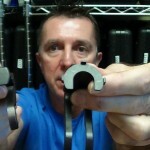 DenLorsTools.com Summary: Automotive repair blog and video comparing two Miller specialty tools. We have had a lot of questions regarding the Miller 8387 Valve Spring Compressor and the 8516A Rocker Arm Remover/Installation Tools. Both look similar and are for use on Dodge and Jeep 3.7 and 4.7 liter engines. These motors are commonly used in Jeep Liberty, Dodge Durango, Dodge Dakota, Jeep Grand Cherokee etc. *Note – The 8516 has been updated and the newest number has an “A” on the end now making it 8516A. Each tool is for a different job. 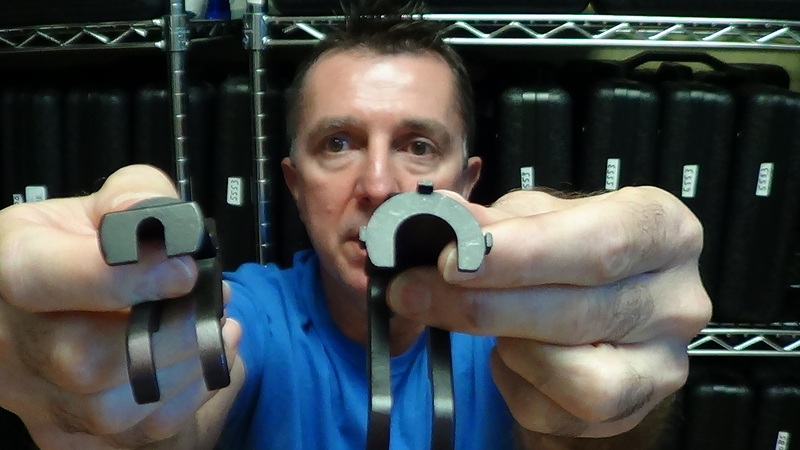 The valve spring tool allows access at the valve keeper so a magnet can be used to remove it. The 8516A does not have the opening to allow access to the valve keeper. 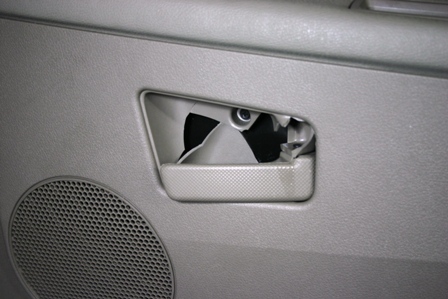 Round Jeep Commander interior door handles share the same problem as Grand Cherokees. 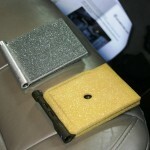 © DenLorsTools.com Summary: Jeep Grand Cherokees and Jeep Commanders share a faulty interior door handle assembly problem. The shape of the handles may be different in each model, however the problem is with the incorrect resin mix which results in a brittle and crumbling material causing failure just the same. This is obviously a manufacturer’s defect, however it’s a fault that is NOT covered under Jeep’s warranty. And no, there’s not a recall or service bulletin out on them. Until recently this problem was not solved, the only fix was replacing the entire door panels. Now there’s a better way! Access for the fan control module can be gained from behind the headlight. 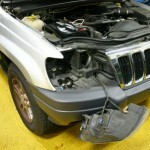 © DenLorsTools.com Summary: This auto repair blog covers overheating problems with Jeep Grand Cherokees ranging from 1999 to 2004. The cooling fan module location is shown. The cooling fan module is a common problem that can cause the radiator cooling fan not to work. Time saving suggestion to allow much easier access to the cooling fan control module for replacement. Questions and answers for this and other overheating issues covered in comment section. 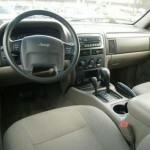 © DenLorsTools.com Summary: Recent comments from a do it yourself-er that has used a previous article on Jeep Grand Cherokee dash removal. Jim was nice enough to let us know how he has used our information not just once, but on two occasions for different problems. The ability to tackle dash removal has saved him a ton of money. 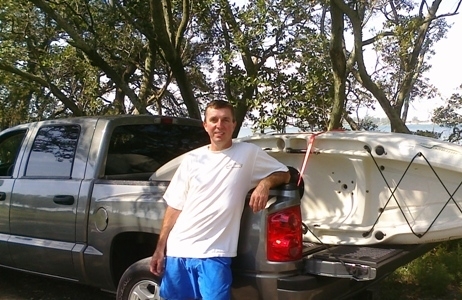 I think we saved Jim a lot of time – now he’s returned the favor by basically writing this blog! Thanks Jim. Summary: A severe misfire with a 3.7 or 4.7 Dodge or Jeep vehicle that is accompanied with an engine noise on the top end and backfiring through the intake or exhaust could have a fallen rocker arm. This is becoming a quite common and somewhat puzzling occurrence. Learn what the leading cause of this problem is and if the repair could possibly be covered by the manufacturer’s warranty. Owners of a 3.7 or 4.7, discover what steps can be taken to help prevent this problem from occurring in their vehicles. 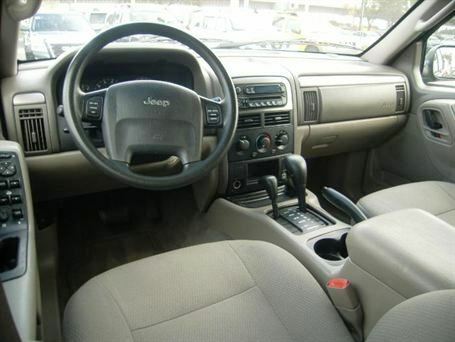 © DenLorsTools.com Summary: Jeep Grand Cherokee’s with dual zone have a common problem of blend doors breaking at the point of actuator engagement. 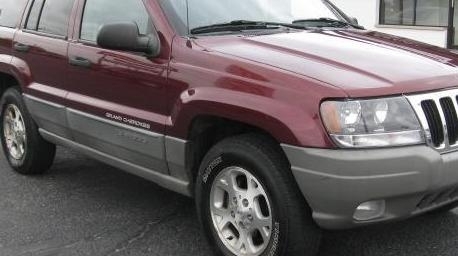 Vehicles affected are 1999, 2000, 2001, 2002, 2003 and 2004 Jeep Grand Cherokees. 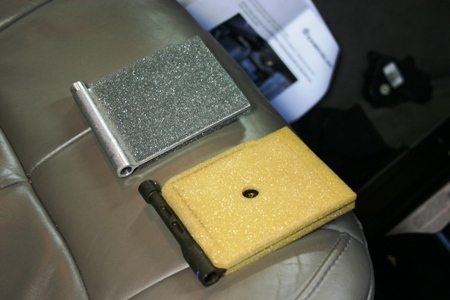 The automatic temperature control can be affected on the driver or passenger side, making the temp control inoperable. Until recently the refrigerant had to be discharged and the dash removed for repair. Now with a WJ blend door repair kit # K6855685AB, from Mopar/Chrysler/Fiat the repair can be done in the vehicle by even modestly experienced individuals. The kit includes an aluminum door door, a plastic door, a spindle, grease and patch material for resealing the evaporator case after repair. PDF Jeep instructions provided in this car repair article. 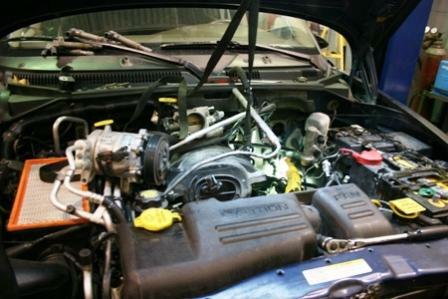 NOTE – Since this article was written Jeep has discontinued this repair. We have the alternative kit available which is similar. Our kit makes the doors work together as one eliminating the possibility of ever having to remove the entire case to access the rear actuator. 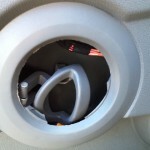 The updated version we sell uses the front, easy to access motor just behind the glove box to control the door. Please verify yours is broken before ordering. See the kit currently for sale at the following link. K6855685AB Alternative. *Please don’t order based on symptoms alone. Please verify this is your problem before ordering. 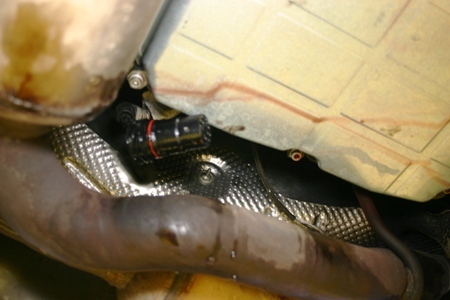 Common transmission leak on many Chrysler products is the electrical plug housing. ©DenLorsTools.com Summary: A common (Chrysler product) transmission fluid leak which affects many models including Jeep Grand Cherokees is covered here. 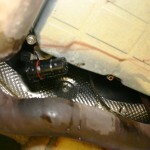 The leak can easily be mis-diagnosed as a leaky pan gasket. A lot of unsuspecting consumers may end up spending a thousand dollars or more to rebuild a transmission with a leak like this. There’s no recall at this time from Chrysler, perhaps there should be, with such a widespread problem. 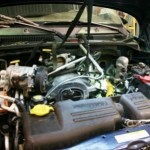 The good news is that this auto repair blog describes the source of the problem and how to repair. A simple repair process to stop the leak for the cost of around ten dollars. Even a do-it yourself-er and can save possibly thousands of dollars from having a mis-diagnosed leak repaired by a transmission rebuild. 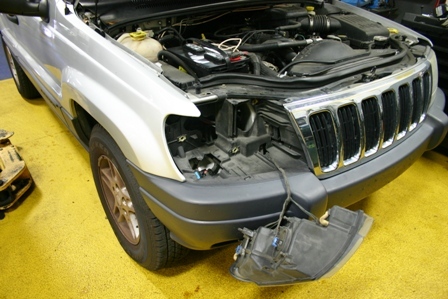 The vehicle that the transmission leak occurred in, in this case was a 2007 Jeep Grand Cherokee Laredo 3.7L, GAS, Vin K, Eng Cfg V6.